Thank you for visiting. We have now moved all our blogs to our new site www.londoncoachinggroup.com. From there, we will be blogging, as well as posting information about our latest events. To go directly to the blog, please click here. Please also note that you can sign up to our blog updates while downloading any of the resources we have on the above website. Most business sales end with the new owner taking complete control over the business and the old owner relinquishing all official interest in the company. But it is also possible, and often desirable, for the seller to stay on in the role of advisor and consultant. This can make sense on many levels. The outgoing owner is the person who knows the business inside out, from dealing with suppliers and employers to understanding the customer or client base. It can be beneficial from the seller’s point of view, as they are given an opportunity to tie up loose ends and be sure that they are placing the new owner in the best possible position for the business to succeed. But having the seller stay on as advisor can be even better for the buyer, especially if they are relatively inexperienced in the particular field or in business management. It can act to sweeten the deal and provide the buyer with a level of security going into the purchase, and having this safety net can add value or even make or break the sale. The seller can in most cases certainly offer the buyer experienced, informed advice. But it is important to consider whether this is needed or useful in the new business structure. The new owner may have very different ideas on the company’s future and these could conflict with the old view. If the buyer is planning on continuing with the same strategy then the seller’s guidance is likely to be more useful and appreciated. In this scenario, they can offer tailored advice and act in a more hands-on role with regards to training and development. If the outgoing owner does stay on in an advisory capacity, it is important that both parties understand and are happy with his or her new role. While it may be difficult to view the buyer as the new head of the business and a degree of emotional attachment is only natural, the seller must be able to accept their new position. It can be helpful to clarify their role in a formal contract, confirming them as a freelance consultant for a defined time period. This document should elucidate the parameters of the position in a clear and straightforward way, including areas such as working hours, particular areas where they are expected to provide advice and any training responsibilities. One of the issues that can come up with this arrangement is a conflict of interest between the seller’s advisory role and any new projects. While it is natural to want to focus more time and energy on new endeavours, if the seller stays on as a consultant it is only fair to ensure that any advice is appropriate and impartial. The seller might also be planning to set up a new company in the same, or a related, field. This could lead them into direct competition with their old company, which is clearly a conflict of interest and not in the new owner’s best interests. Any relevant plans should be declared prior to the sale being concluded and it is common for contracts to include non-competition clauses. Read this before you start your next business…. Why did you go into the business you are in right now? Chances are that you chose your business because a) You knew how to do it better that others; b) It seemed like a great idea at the time or c) You got in to support someone else who was already doing it. What a lot of business people do not realise is that just by choosing to be in a certain industry, you have predefined how much return you are going to generate – even if you are the best in that business. Below is a chart of a study of various industries and the return that they generate on average. What’s clear here is that you cannot be an airline company and expect to be extremely profitable if you do not have a lot of capital to invest. Some businesses can only grow in profitability with continual capital investment. Others however, can be a lot more nimble and return generate a lot more bang for every pound they invest. Which business would you choose now (ceteris paribus)? All business is not defined equal. The industry you are in has by far the largest impact on how much money you are likely to make. For those of you at a stage where you are thinking of expanding to other businesses, do give this a serious thought. If you recognise that you are in an industry which requires capital and finance to grow, don’t lose heart yet. If you are clear that you want to grow and require help accessing finance, drop us a line and let’s talk about the options on the table. The first is mental and physical involvement – the extent to which we put our creative and physical energies into the pursuit of a goal. The other is emotional investment – the extent to which we put our happiness, self-worth and well-being on the line in our pursuit of a goal. We can choose to have higher or lower involvement and similarly higher or lower investment in every goal that we set. This is when you don’t particularly care what happens and are also not doing anything to move towards your goals. A person who doesn’t care about how well their business performs will be unaffected by the trials and tribulations most entrepreneurs go through. He/ she is also unlikely to do anything to change the situation. Choosing this strategy is an extremely low stress and relatively easy way to exist. Unfortunately, not only do you miss out on the fun of creation but also undermine the potential impact you could be having in your life and in the world. This is the realm of the ardent fans and the moral pundits. If you follow any sport, you will recognise the emotions associated with watching a play and at the same time watching our own emotions go through a roller coaster as our team does well or not so well. Usually, besides cheering our heart out (or praying perhaps), there is little we can do to affect the final result of the game. This is a primary example of a situation where we care too much but have little ability to ‘do’ anything about it. However, often our lack of real action boils down purely to our bad habits and our reluctance to take ownership of our situation. We get invested emotionally and realise that there is so much that requires to happen that we shock ourselves into helplessness and feeling overwhelmed, do nothing. This is the mantra you hear from most motivational Gurus. Work long hours, take massive action, do whatever it takes! And enjoy the emotional roller coaster through the thrill of winning and the agony of defeat. For a person approaching life with this strategy, one minute they’re on top of the world and the next they are down in the pits of despair. In fact, how they feel is dependent entirely on which point of the roller coaster ride they are on when you speak to them. While this is often a very effective short-term approach, it often leads directly to burn-outs and broken families and often times even scares people from setting any more goals for themselves. 1) Identify which things are in your ‘Circle of Control’, which are in your ‘Circle of Influence’ and which are in your ‘Circle of Concern’. 2) Begin to consistently remind yourself that your happiness and well-being is not out there at the end of a rainbow but right here regardless of what happens and how things turn out. Decide to do anything and everything required to achieve your goals but be gentle on yourself when things do not turn out the way they should – especially when these results are outside your ‘Circle of Control’. This approach allows you to have all the excitement of being fully engaged in what you do without any of the stress of being emotionally invested. You do not need to continue taking pit-stops to refuel your emotional tanks and can keep going consistently. In summary, an old story comes to mind. Often by letting go of trying to control the uncontrollable, we actually increase our influence and also make meeting our goals a lot easier. I was recently pointing out to my son how geese always seem to fly in the “V” formation. I explained to him that as each bird flaps its wings, it creates an uplift for the bird immediately behind it. 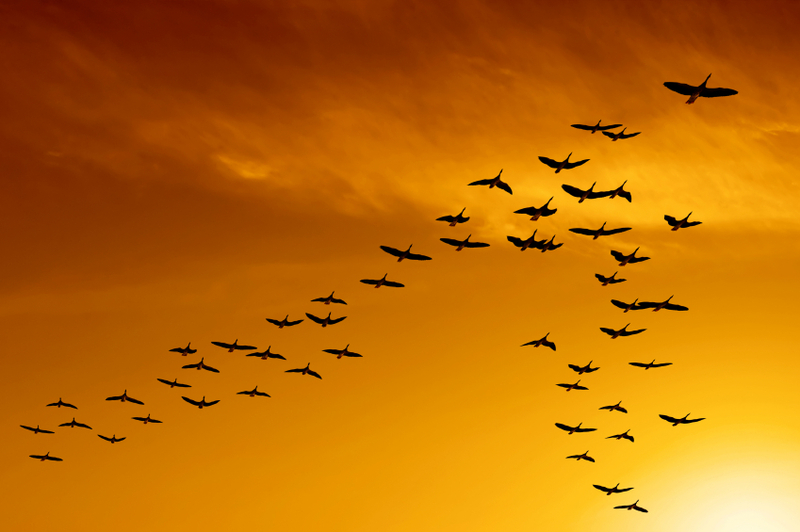 By flying in this “V” formation, the whole flock adds a significant amount (up to 70 percent as I researched later) of greater flying range than if an individual bird was flying on its own. Sharing a common direction and a sense of community gets geese where ever they are going more quickly and easily because they are travelling on the thrust of one another. When a goose falls out of formation, it suddenly feels the drag and resistance of trying to go it alone – and quickly tries to get back into formation to take advantage of the lifting power of the bird in front. What can we as business teams learn from the geese? How much easier does life and business become if we stay in formation and aligned with other people who are headed the same way we are? How often do we check with our teams that we are indeed flying in formation? Interestingly also, when the head goose gets tired, it moves back in the formation and another goose flies point. It is sensible to take turns doing demanding jobs, whether with people or with geese flying south. A leader’s job is tough. But a leader’s job is not always to be at the front – sometimes leadership happens from within the team. Finally, and this is important, when a goose gets sick or is wounded by gunshot, and falls out of formation, two other geese fall out with that goose and follow it down to lend help and protection. They stay with the fallen goose until it is able to fly or until it dies: and only then do they launch out on their own, or with another formation to catch up with their group. This is really what team work is about. You don’t always have to look far and wide to understand the secrets of great and winning teams. Sometimes you just have to look up! Selling a business isn’t always easy, but the emotional aspect of the sale is often overlooked while the organisational element takes over. In the midst of finding the right buyer and negotiating terms, it can be important to take stock and deal with the mental impact of the sale. Business owners invest a lot of time and energy in building up and running their businesses, so it is only natural to build up a personal connection during this time. It’s likely that the business is more than just a job, and rather a way of life. But at this crucial time, it is more important than ever to remain as objective as possible and not let emotions cloud your judgement or overrule sensible decisions. Whenever you feel you are becoming too emotionally involved, take a step back and re-evaluate the situation. Fortunately there are a number of steps you can take before selling a business to make the process easier all round. Prepare a thorough exit strategy before putting the business up for sale so that you are prepared and can deal with whatever scenarios are thrown your way. The process of making arrangements will help to get you in the right mindset as well as making the process more streamlined. Don’t forget to include solid plans for the future, when the business is no longer a part of your daily life. It can also be helpful to talk to any previous business owners who have been through the same selling process. At this stage, it is vital to remain attentive to the needs and everyday running of your business. Buyers do not want to see sales plummet or similar scenarios during this time, and until the sale is finalised they can always pull out. It is likely that business owners will need the help of professionals such as brokers, solicitors and accountants to deal with certain aspects of the sale. As well as providing the necessary professional input, the inclusion of third parties also adds impartiality to the process. It is possible that the buyer will want you to stay on in a consulting role for a set period of time, typically a few months, and the emotional consequences of this should be carefully considered. Being a consultant is a very different role to business owner, and it may be that many decisions are made that you don’t agree with. It can be difficult to see a business that you have built up going in a different direction. On the other hand, having no involvement afterwards can be even harder. This can be the time when the emotional impact of selling is most keenly realised. There may be a sense of loss and it can be difficult to let go of daily routine and relationships with employees. It is usually best to make a clean break from the business, unless you are still involved in some capacity. This is the time to look forwards rather than backwards, and to move on, focusing on turning future plans and ambitions into reality. Yes, it sounds too good to be true, and truth be told, there is a catch. The catch is that you need to take on more risk – but the secret is it’s no risk at all. In reality, you’re making a calculated gamble, one that you’re near guaranteed to win. You see, in your average customer interaction, you ask the customer to bear the risk. They pay for a product or service and if it’s defective, doesn’t do what it says, or doesn’t satisfy them in some way, they lose out. They’re taking a gamble with you, and with a history of slick salesmen and devious dealers shifting shoddy wares, the risk they are taking is quite real. YOU know the value and quality of your work, but THEY only know what you’ve told them, and they’ve been taught that they can’t trust you. This becomes a “barrier of entry”. That means that there’s a reason in front of the customer NOT to buy your product. This barrier of entry is what is standing between you and a dramatic sales increase. So lower the barrier of entry – reverse the risk. The barrier is that the customer is worried that the product or service they’re taking on may not be all they expect. The barrier is that they are taking a risk with you. So how do you lower the barrier? You take the risk away from them, and shoulder it yourself. You tell them that if they are not satisfied with your product or service, you’ll give them a full refund or replace the product. Sounds like a risky move, right? I mean, what if people take advantage of you? What if they use the product or service for awhile and then return it when they have got what they needed out of it. You’re left in the dust. This is a legitimate fear. Even a possible scenario. But historical statistics tell you that it’s improbable that your customers return for the refund, and near-guaranteed that this approach increases your sales. You can safely take this bet, because where the risk to the customer is quite real, the risk to you is actually minimal. And if you don’t believe that, then believe history: there are those that have paved the way before you. The most common scenarios are that companies double or triple their sales by introducing a risk reversal statement, with a maximum attrition of only 5%. Even if you only increase your sales by only 50%, who cares that you’re losing 5%? You’re still increasing your overall sales by 42.5% (100% original sales + 50% new sales = 150% x 5% returns = 7.5%. 50% increase minus 7.5% = 42.5%). You do the math using your company’s own statistics and see what that the real numbers for you are. Let’s say you typically sell 1,000 products a year, which bring in £500 each. That’s a total annual sale of £500,000, and at an estimated gross margin at 25%, making you £125,000. Introduce a risk reversal strategy and let’s say it increases your sales by a conservative 50%. Remember you are significantly lowering or even removing all barriers to entry. That brings you to 1,500 sales, which now gives you a profit of 1,500 x £500 x 25% = £187,500. Even if 5% of your customers take you up on your guarantee (and that’s the highest across most companies – it’s likely to be a lot less), then you have 75 returns. The cost of this ‘wastage’ is actually only 75 x £500 x (100% – 25%) which is £28,125. So even if you take away the costs involved in the 5% returns, then you’ve still made a profit of £159,375 – which is £34,375 more than you were before you introduced the risk reversal strategy – and you didn’t even spend any money to do it! That’s a 27.5% increase in profits – and that’s assuming you can’t resell these returned products! So the reality is, you’re not really taking much of a risk at all. To the customer, it shows that you fully and completely believe in your product or service enough to take on the risk yourself – it proves to them that you can be trusted. As long as what you’re doing is what you say you’re doing, then only the smallest percentage of people will demand a refund. The best part is incorporating a risk reversal into your marketing and sales messages will cost you near nothing: any benefit you gain comes at pretty much no cost. Alright, ready to take the plunge and start increasing your sales? It’s probably best not to jump in the deep-end here and, instead, do some trials and tests. There are different levels of risk reversal, so you can start lower in the hierarchy and work your way upwards. This is where you burden some of the risk – for the things you essentially have control over. For example, if you were selling televisions, a partial risk reversal would be offering to replace or refund the television should it be found to be defective. This is where you accept the burden beyond just the actual quality of the item. That means accepting if the customer is dissatisfied in any way at all, even if they just have decided to change their mind. So in the TV example, you wouldn’t just offer a refund if the television was defective, but if the customer wasn’t satisfied in any way at all – even if it just doesn’t “look good” once it got home. This is where you not only accept the full risk of the customers’ dissatisfaction, but if they are dissatisfied, they leave with a little bit extra – for the inconvenience. So in the TV example, you could offer the TV with a gift of, say, a CD holder, and if the customer were to return the television, then you offer to refund the TV but let them keep the CD holder. You could offer a free gift, a report or information of some sort, or even a voucher. Get creative and up your value! Remember, although it seems like you might make a loss from the returns here, it’s proven that these tactics will increase your sales dramatically enough that any loss made won’t dent your profits. But you don’t even need to take that as gospel – try it out! Start with a campaign that includes a Minimal Risk Reversal statement in it. Measure the results. Then try one with a Full Risk Reversal, then one with the More Than Full Risk Reversal. Test, test, test – that’s the only real way to see what is going to work best for your company. That said, we can guarantee that this strategy will work. And you’ll have your money back. The use of seller finance to facilitate the buying and selling of a business naturally involves two parties – the buyer and the seller. As such, both parties have to be satisfied with the arrangement and be as sure as they can that the advantages to them of such a procedure outweigh the disadvantages. However, what may be good for the seller may not be so good for the buyer, and vice versa, so it is necessary to look at the deal from both sides of the fence. By offering seller finance, the seller can dispose of the business quickly and move on to fresh pastures. Furthermore, experience shows that those who offer seller finance obtain a better price for their business than those who don’t. The seller also gains by being able to charge interest on the loan and could also benefit from an advantageous taxation angle, as the financial gain is spread out over a longer period and may not be subject to one single large tax deduction. On the minus side, the seller always lives in fear that the buyer may default, or that they lack the business acumen to run the business successfully, running it down to a point where they cannot repay the loan and the business is difficult to turn around in the event of a foreclosure. In other words, the seller has to maintain an ongoing connection, whether wanted or not, and retains risks while losing control. To guard against such possibilities, the seller needs to hold some kind of security, although they may find that a bank already has first claim on the buyer’s property or other valuable assets. Finally, there is the long-term cost of the transaction. By loaning the buyer money to purchase the business, the seller may be unable to take advantage of a more profitable venture that appears elsewhere. Aside from the obvious fact that seller financing can get a buyer into business if the banks refuse to advance the money, the fact that the seller is willing to loan money to enable the purchase indicates that the seller has confidence in the future fortunes of the business. In addition, seller financing speeds up the purchasing process, allowing the buyer to get started sooner than would otherwise be the case, while the seller, who remains connected to the business and interested in its well being, is available for advice and guidance. Furthermore, if the seller is desperate to offload their business, it may be possible to negotiate not only a very favourable price, but also better terms and conditions than would be available under normal circumstances. In comparison to borrowing from a bank or paying cash up front, buyers often pay a higher price over a longer period of time with seller financing. As with any sale, the buyer also needs to check the reasons for the sale and be 100 per cent satisfied with them, as the seller may only be offering seller finance to shift a bad business. The same applies if the price appears to be too much of a bargain. Lastly, when opting for seller finance, the buyer may have to put up a larger deposit than they would like because of the default risk, and even then will possibly have to put up some collateral, such as their home. Igor Ansoff, a Russian born mathematician and business manager, is often known as the father of Strategic management. One of his seminal pieces of work has been the Ansoff growth matrix, a framework that is taught in most management institutions across the world today. In brief, the Ansoff growth matrix seeks to help businesses map strategic product market growth by honing in on developing products and/or markets. The Ansoff Matrix has four alternative marketing strategies – Market Penetration, product development, market development and diversification. Market Penetration is the most relevant for current products in an existing market. In this strategy, there can be further exploitation of the products without necessarily changing the product or the outlook of the product. This is often the lowest risk of the four strategies and often the attempt is to increase number of transactions and conversion of leads and enquiries. Product Development focusses on either introducing new products to existing markets or modifying existing products. Typically our average value based strategies revolve around developing or enhancing products and up selling/ cross selling. Market Development or Market Extension involves the business moving to new markets with its current set of products. This can be done through segmenting the market, moving to new geographies, franchising or setting up new distribution channels. This strategy assumes that the existing markets have been fully exploited. Clearly, this strategy is riskier and secondary to the previous strategies. Diversification involves marketing or selling new products to new markets at the same time. It is by far the riskiest of strategies as it involves two unknowns. Before starting to diversify the business needs to have done a clear risk and return assessment. Diversification could be related (within the same broad industry or sector) or unrelated (similar to Virgin Group). This is often an attempt to build a portfolio of businesses and decrease overall risk for the business owners/ shareholders. The Ansoff matrix helps the small business owner identify which strategy makes the most sense. Working with businesses across industries, I’ve often found that the ‘exciting’ things to do are often fraught with risks and more importantly not the most profitable. Most small businesses would not figure in the 100 largest companies in their industry in their location. What that immediately points towards is that Market Penetration is likely to be by far the most useful and profitable strategy. The trouble often is that for an entrepreneur, doing more of the same thing is ‘boring’ and they yearn to start experimenting again. As one of my mentors once told me, the most successful small businesses focus on saturating their current market rather than expanding to new ones. It is satisfying to the ego to have a client in every part of the world but it is immensely more satisfying to have ten times the number of clients in a radius of ten miles from where you are – and often a lot more money in your pocket too. When working with business owners keen to diversify and enter new markets, we often first go back to fundamentals to check how much of the current market has been penetrated by the business. For most small businesses, the answer is usually less than 1%. If you do decide to pursue the riskier strategies, make sure they are not at the expense of the simpler and more profitable ones. Want to sell your business? Take some time off! One of the key considerations while buying a business is whether the company would perform well without their owner for a long period of time. Clearly, if the business is entirely dependent on the business owner, its value without the business owner is marginal at best. We are now working with a few of our partners to provide content for their websites and blogs. For the full article, please go here.